There's no need to run out and buy expensive Valentine's dcor, you can make your own for pennies on the dollar! Check out this cute vase from DIYer Adeina Anderson. Wash and dry the mason jars. Then paint the whole jar with white, let it dry for about 20 minutes. Then using a sponge brush, paint stripes in another color of paint; let that dry another 20 minutes. 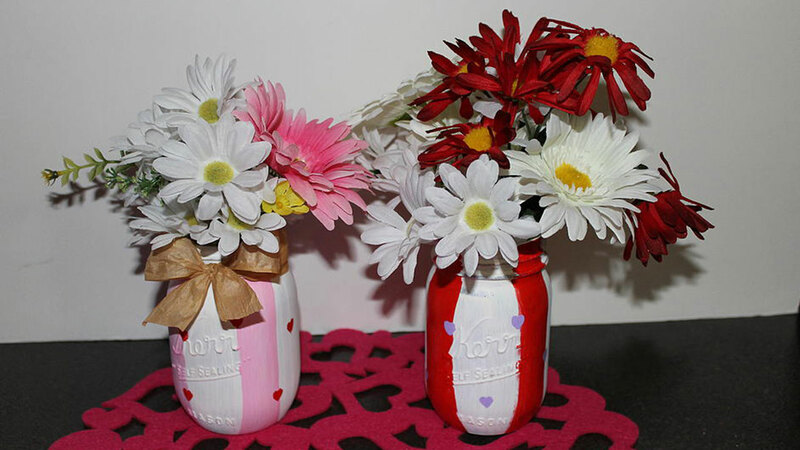 Using the heart stencil, and small paint brush, paint hearts in another color all over the jar. Let the jar dry at least an hour before you add your flowers. You could use real or fake flowers. Be sure to check out Adeina's website www.craftingwithadeina.com for more ideas.